The Denver Omelet is a classic diner order, especially with a side of hash browns or toast. Piled high with ham, onion, bell pepper, and cheese, it's a meal in and of itself. And while there is nothing wrong with diner food, it's also an easy breakfast dish to make at home and customize according to your own taste. Like your breakfasts spicy? Add some diced jalapeño. Only have bacon, or dare I say it, Spam on hand? Dice it up and swap it out for the ham. And while cheddar is the traditional choice, any melty cheese will do. This recipe makes one big omelet that will easily feed two people. But, feel free to double it and make two big omelets for a crowd of four to six. Likewise, feel free to halve it for a party of one—just use a smaller pan. Serve with hot sauce or salsa and enjoy! Heat the oil in a large nonstick skillet (around 12") over medium-high heat. Add the onion, bell pepper, and ham. Sauté for about 2 minutes, or until lightly browned and the veggies are tender, but still a little crisp. Season with salt and pepper. Remove the veggies and ham to a plate. Carefully wipe out the skillet with a dry paper towel. Turn down the heat to medium-low and add the butter. Once melted, tilt the pan to coat with the butter. Add the eggs. As the eggs begin to set up around the edge, carefully use a spatula to lift the edges a bit and tilt the pan slightly to let the liquid egg in the center run under the edge. Repeat around the omelet until it has set up just enough not to run to the edge when you tilt the pan. Don't let the omelet get too thin in the middle, and turn down the heat if it is cooking too fast. Season with salt and pepper and top all over with cheese. Place a lid or pan over the skillet for 1 minute or just until the cheese is melted. Turn off the heat. Add the cooked veggies and ham in a line in the center of the omelet. Use a spatula and carefully run it under the edge of the omelet to loosen it without tearing. Fold one side of the omelet over the filling, then overlap with the opposite side, making a parcel. 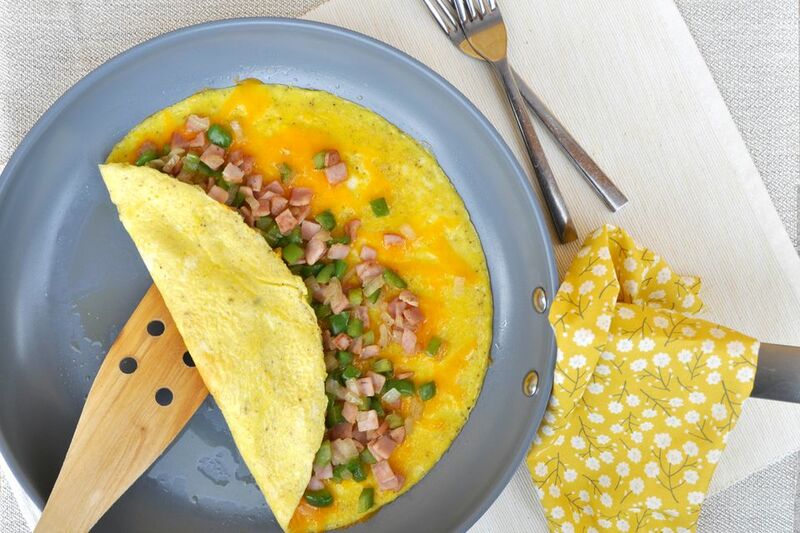 Carefully slide the omelet onto a plate. Serve immediately with hot sauce or homemade salsa and enjoy.